This sample project demonstrates using the ADO Find method to locate records in a Jet database. This application is using arguments that are of the wrong type, out of acceptable range or in conflict with one another. The Find method is a single column operation only because the OLE DB specification defines IRowsetFind this way." Add a command button and text box to the form. Set properties on these controls as listed in the following table. 'Trap the user's search entry. strCriteria = "CustomerID = " & "'" & txtCriteria.Text & "'"
'Open the Northwind Customers table. 'Find the first record matching the criteria. 'Provide a response to the user. 'Display the customer's name, phone and fax number. Save the project, then run it. 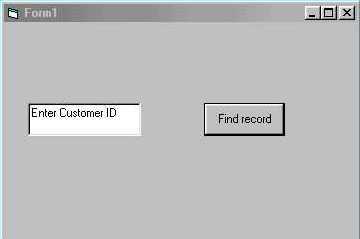 Enter a valid customer ID, like 'bonap' or 'tortu' in the text box, then click the command button. You can also use like as a comparison operator. Use an asterisk in the criteria string to find one or more occurrences of a value. For example, "state like 'M*'" matches Maine and Massachusetts. You can also use leading and trailing asterisks to find a substring. For example, "state like '*as*'" matches Alaska, Arkansas, and Massachusetts. Asterisks can be used only at the end of a criteria string, or together at both the beginning and end of a criteria string, as shown above. You cannot use the asterisk as a leading wildcard ('*str'), or embedded wildcard ('s*r'). ""CustomerID like " & "'" & txtCriteria.Text & "'"" . Save the project, then run it. Enter a value like b* or bo* in the text box, then click the command button.